Bring your lawn chairs and come on down to Holly, Colorado the 2nd weekend in June. The Festival will be held at the permanent venue, Gateway Park. 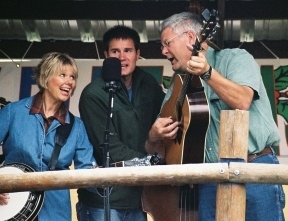 The annual Holly FREE Bluegrass Festival is held in conjunction with Holly Days which commemorates Holly’s recovery from the 1965 flood. It is the only FREE bluegrass festival in Colorado and is a good day for family fun. FRIDAY NIGHT AT THE PARK – Jam Session and eats starting at 6:00 p.m. with various musicians and bands joining together for a lot of pickin’ and singin’. Bring your instrument, your voice, your appetite, your chair, and enjoy an evening of music. SUNDAY SERVICE - Featured artist will be Tried by Fire, begins at 10:30 a.m. “Dinner on the Grounds” will be available at noon. Join us for gospel singing, worship, and fellowship.